IMPULS MEDES BIKE, wins ONCOBIKE 2018! The third edition of Oncobike raises about 36,000 euros! A total of 350 cyclists distributed in 57 teams have participated this year in the solidarity event. L'Oncobike, the BTT solidarity race organized by the Oncolliga Girona Foundation, the Club Ciclista San Gregorio association Riscos de la Llémena, has managed to collect nearly 36,000 euros in its third edition, held on Saturday 10 November in the Llémena Valley. The money will be used to finance the new Comprehensive Oncological Aesthetic service that l'Oncolliga has launched this year to improve the welfare of cancer patients. A total of 350 cyclists distributed in 57 teams have participated this year in the test, 44 of them in the longest option, 200 km, and 13 in the short option, 150 km. The two routes run along roads and tracks in the Llémena Valley, with checkpoints and refreshment points in Sant Gregori, Llorà, Sant Esteve de Llémena, Sant Aniol de Finestres and Canet d'Adril. 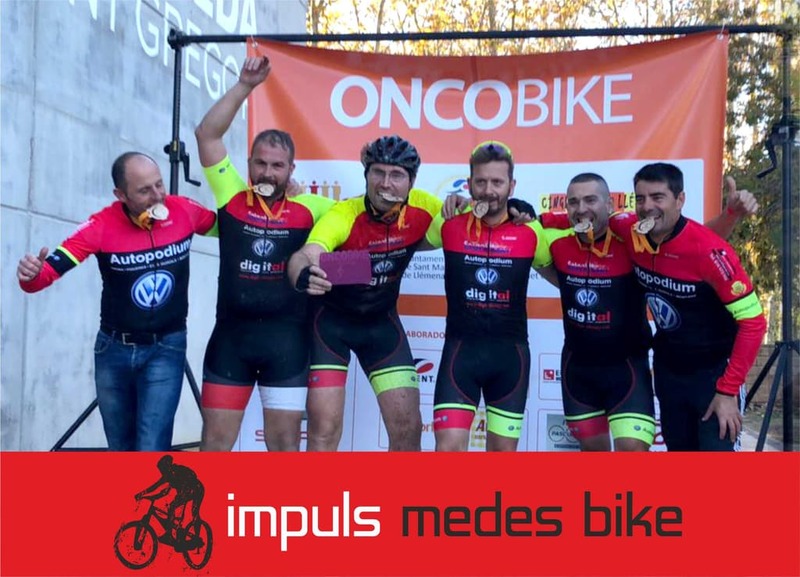 Of those who have done the short course, the first to cross the finish line were the members of the Onco Impuls Medes Bike, with a time of 8 hours and 41 minutes. For its part, the Hors Categorie Girona Klassmark team was the first to complete the longest route, with a time of 9 hours and 52 minutes. The classification of the race could be followed live online through the web www.9hsport.cat. Congratulations on the great career to: José Berengüi, Miquel Planas, Francesc Tauler, Jordi Alonso, Carles Mercader and David Benitez.